Founder and Director of Britton Real Estate, Marcell Irawan is working in an industry that he has held a life-long passion for. Coming from a family of property investors, Marcell always held a strong interest in the property market and in how property can grow wealth for people. Marcell established Britton Real Estate in 2012 and since then has established himself as a well respected Agent, highly regarded by his peers and former clients. Marcell is known for his integrity in all business dealings, and has an unwavering moral compass which ensures all his clients are treated honestly, compassionately and with the utmost respect. 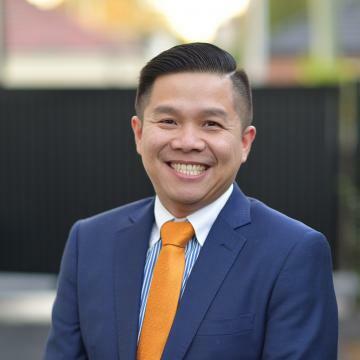 Well educated, Marcell has a Marketing Degree as well as an MBA in Accounting; his knowledge of Accounting is a real benefit to his clients, as he is an outstanding number cruncher and can really assist his clients to maximise their wealth through property. A skilled negotiator, Marcell is always mindful of securing the optimal price for his sellers, and has proven strategies and a trail of successful outcomes that have led to an increasing referral base from past clients. "Property is not about bricks and mortar; it is about relationships, I have always known this, and have worked my business model around establishing trust and building long-term relationships with my clients that do not revolve around a single transaction." There is literally nothing more satisfying to me than to achieve a great outcome for my clients; if they are happy, then I am ecstatic, truly! This is what I am here for; this is what drives me ,their success." When not working Marcell enjoys spending quality time with his family, as well as swimming, travelling and listening to music. Peaceful and modern , this renovated home offers a relaxed environment for growing families. Convenient location is a short stroll to Coxs where cafes and amenities are aplenty. Also to Kent Rd and Lane Cove Rd where frequent buses provide an express service to the city or southern Sydney. Or easy walking distance to Macquarie Park station. Feature of the home : - Massive size master bedroom with ensuite and walk in warddrobe. - Flowing single level layout with low maintenance lifestyle - Gas cook top in new caesar stone kitchen. - Cable TV ready and excellent internet connection due to close proximity to local exchange. - Light filled bedrooms appointed with built-in wardrobes - Well maintained full bathroom with floor-to-ceiling tiles - Large family room - Tandem car space for up to 4 cars with lock up car ports for 2 cars. Gorgeous Family Home in Blue Ribbon Location!!! This newly renovated family home is set to impress anyone seeking a peaceful lifestyle home in a blue ribbon location, the home is only a stroll to all local amenities. - Impressive from the outset with a renovated appearance. - Air Conditioning throughout. - 3 large bedrooms with built-in wardrobes. - 1 garage space and 1 open space - 2 renovated bathrooms and modern kitchen. - Tiled flooring. - Lovely outdoor & landscape gardens. - Short stroll to popular schools, cafe, parks and transport. Be quick, this rental won't last! Brand new contemporary apartment with beautiful rooftop gardens and landscaped surrounds. Conveniently located in North Ryde with train station at your door, one stop from Chatswood and Macquarie Park. - Bedroom with built in wardrobe. - Air conditioning. - Short stroll to North Ryde train station. - 5km away from Macquarie University, Macquarie Shopping Centre, Macquarie Park, Chatswood. - Bathroom with floor to ceiling tiling. - Modern kitchen appliances with gas cooking, oven and dishwasher. 2 Bedroom Unit Close To Everything! If you value space, privacy and lifestyle, You will be impressed by this newly renovated apartment gracing the ‘Greenwich’ wing of Rosebery’s sought-after Metro Village. Showcasing as-new interiors full of light, Brand New Kitchen and style, it offers contemporary living with exceptional quality. Positioned in a rapidly growing city fringe location, this two bedrooms apartment offers a stylish yet practical living environment and is washed with an abundance of natural morning Sun light. 1 Bedroom apartment with modern design, spacious living room and an abundance of natural light throughout the entire room. Located in the heart of the inner South, Rosebery has emerged as an aspirational destination for those seeking an authentic, dynamic and convenient lifestyle. Modern living in Sydney’s fastest booming lifestyle hubs. Conveniently located minutes away from Green Square train station, mascot station and 10minutes from Sydney CBD. Inspection by appointment.